From the cellar to the attic - a ladder is needed throughout the house with the most diverse activities, whether washing windows, hanging curtains or storing items in the attic. Floors in a home vary from many different types like wood, tile, parquet , marble and linoleum . Conventional household ladders have the problem that they are not well suited for all floors and thus do not provide optimum stability on any ground. This problem has now been solved and developed with easyclix an innovative foot-change system, which (from model year 01/2015) makes every Hailo stepladder a versatile all-round product . The idea: for every floor, there is the right foot, which can be changed with just a few clicks! 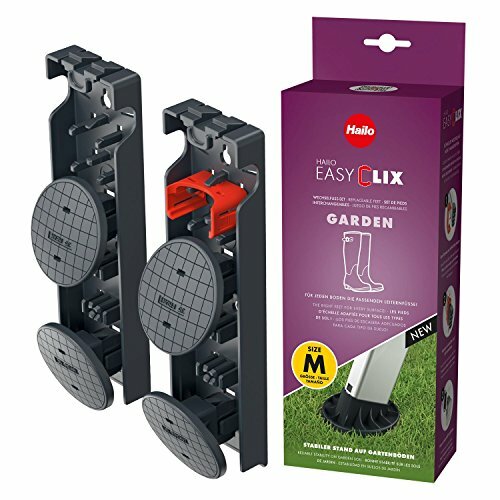 the large, disk-shaped easyclix garden-feet ensure optimal stability particularly on soft surfaces like grass and mulch thus, outdoor use of household ladder is no longer an issue!. If you have any questions about this product by Hailo, contact us by completing and submitting the form below. If you are looking for a specif part number, please include it with your message.